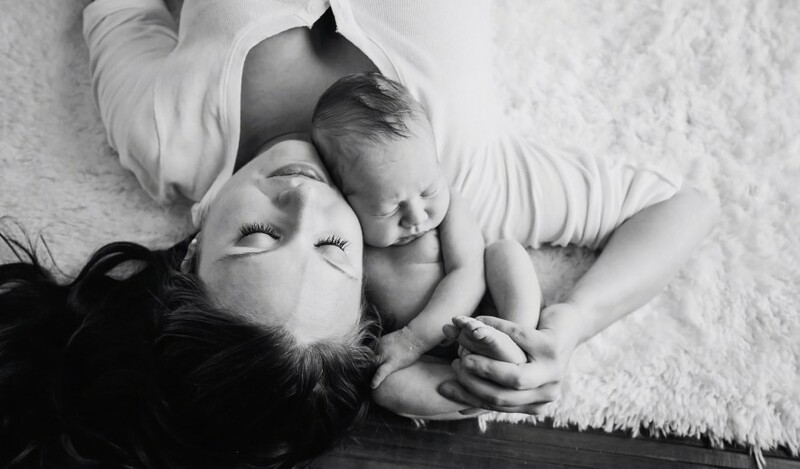 Eek, super late with this post, seeing as how this sweet little boy was actually born this week, but I will go ahead and post it anyway since it’s still so darn cute! So before attempting my four tier whale diaper cake I wanted to do a little trial run so that in case my diaper cake making abilities were a complete fail, I would still have time to scramble for a new gift idea. One of my NC friends Ashley is expecting a sweet little boy in August who is going to have the most adorable nautical themed nursery. This gift was very simple, just diapers and a little nautical outfit, so I wanted to present it in a fun way that would give it a little flare. Aside from the ribbon, outfit and diapers I already had all of the other components in my craft stock, so it was extremely easy to put together. I will go ahead and give you a description of what I did and how I assembled the cake as a guide, but be sure to check out my whale diaper cake post above for a more detailed description (and links to my friend Courtney’s amazing diaper cakes) on how to assemble an awesome little cake! 1 nautical baby boy outfit – purchased via Amazon (currently unavailable, but a link to the image is available here). 2 wooden skewers – small wooden dowels, popsicle sticks or straws would also work! Step 1: For this particular cake I began by fanning the diapers (fold side out) into the two cake pans. The pans are not necessary but they are a good guide and make it much easier to arrange the diapers. Once I had filled the pans and created the two “tiers” for the cakes, I secured them by tying a piece of string around each to hold them in place (this can also be done with large rubber bands). Step 2: I then cut a piece of cardboard (part of the diaper box, lol) in a circle that was a little bit larger than the bottom layer of the “cake” and covered it with blue wrapping paper. For a more finished look you can purchase cardboard cake bottoms but for this one I just improvised. After covering the cardboard with wrapping paper I cut a small 2X2″ “X” in the middle of the cardboard round and set it aside. Step 3: Take your 2.5″ ribbon and cut a piece just large enough to wrap around each tier of the cake. Repeat using the 1″ ribbon. Take your larger ribbon and wrap it around the middle of each cake “layer” and secure it tightly using a dot of hot glue. For the top tier I repeated the same process using the 1″ ribbon, but for the bottom I simply wrapped it around the tier and tied a bow in the front. Step 4: Next I used the pants and top of the outfit to create a “bow” for the top by folding the shirt into a rectangle, then folding the pants in half and then laying them across the shirt rectangle to create a bow (this will make more sense when I explain the next part). Step 5: Take your cardboard round and set your bottom layer of “cake” atop it, then your top layer on top of that. 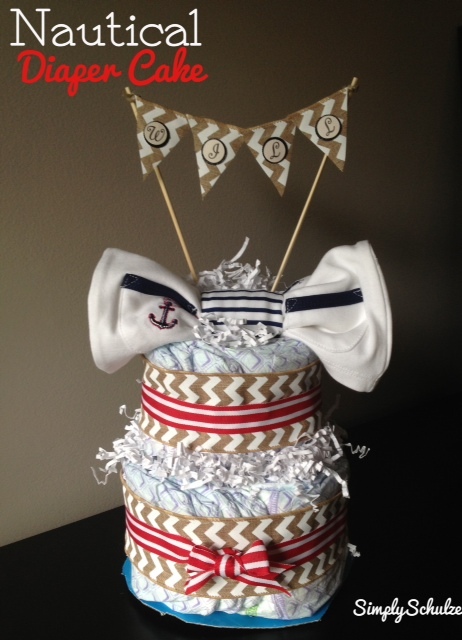 Now you will use your little outfit “bow” to do double duty: both hold the cake together and be the cake topper. I fed the legs of the pants through both cake layers and secured the tips of the toes at the bottom using the cardboard “X”. The top of the cake where the pants were folded over the shirt to create the bow will be held tight (the waist of the pants should just reach over to be tucked into the top of the diaper cake where as the legs will extend all the way down through the cake). NOTE: This just so happened to work out this way with the outfit I had chosen, you can always just top the cake with a pair of baby shoes or a stuffed animal to make it easy, simply secure it with pins! Step 6: Lastly, I created the name banner by cutting triangles out of the wire ribbon and hot gluing them to a piece of twine before adding the stick-on craft letters and gluing each end of the twine to the wooden skewers so as to suspend the banner in between. I made sure the sharp ends of the skewers would be pointing down so that they could simply be stuck into the top of the cake layers without needing any sort of adhesive. That’s it! This was my first attempt at a diaper cake so I kept it small and just worked with what I had. Sorry if the description of my process is a bit confusing, I was kind of just making it up as I went along! Don’t forget to check out my Whale Diaper Cake as well as Wildly Domestic’s tutorials on diaper cakes, she has a whole section of her blog dedicated to them!